JPF: Although you have already established yourself as a very good footballer in Asia, it was during your time with Celtic that the World woke up and started noticing you. Able to share with us more about your Celtic footballing days? SN: There are always 50,000 fans at every Celtics’ home game and that is something, which I really enjoy as a footballer. Apart from that, there is something that I really like about; it is the kind of connection which the club established with the young players. So during my playing time, these young players would be invited to be part of the match day experiences as the players’ “kit-man” to pick up boots and stuff personally for the players. As a young player getting that up close and personal with the players whom they admired is really a great motivation for them. And that is the kind of connection between young players and clubs, which I don’t really see it in Japan yet. And well, I have played 3 seasons of Champions League football during my 4 years with the club, I truly enjoyed the fantastic playing experience. JPF: You have won the hearts of many with your incredible free kick accuracy and even scored against big club like Manchester United. Apart from that, the World also witnessed how you have put the ball into the moving bus. Not forgetting, knocking off the figurine of the Wedding Cake on the Stage with your unbelievable accuracy. Would you be able to share with us how you do that? What’s going through your mind before you take the free kick? SN: Sending the ball into the bus and knocking off the figurine on the Wedding Cake is not my main job – that’s really for fun! I am a footballer actually, haha! But honestly, I really never think much when I am stepping up for the kick. I have put in a lot of effort in my training so when I approach the ball, it’s like a momentum, I step up and strike it. Regardless the number of players forming the wall and position of the goalkeeper, it does not affect me at all. 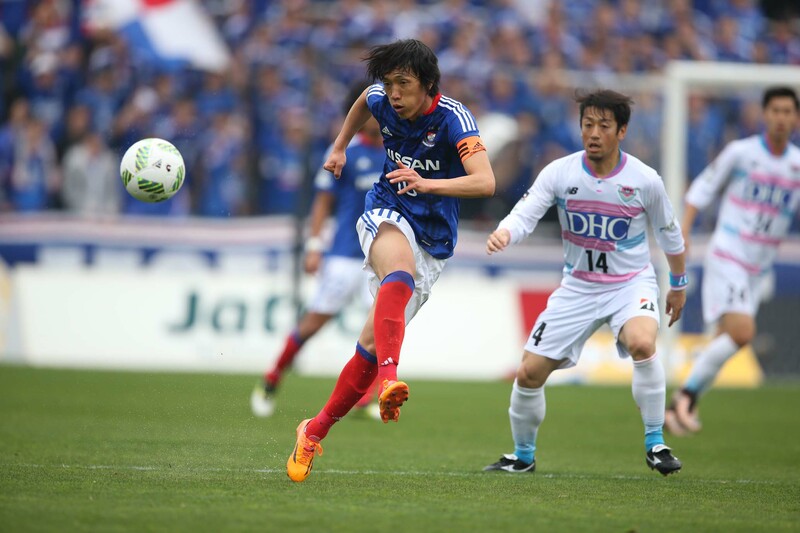 Video: Shunsuke Nakamura bending ball into a moving bus, Click Here. JPF: After 8 years of European football with Reggina, Celtic and Espanyol, you returned to Japan. But why Yokohama F.Marinos? SN: Yokohama is my hometown and I have grown up playing football for Marinos Junior Youth and yes, it is a very straightforward and easy decision for me when I know that I am coming back to Japan. Previously, when I was a young player with Marinos, there were always world-class players or foreign players playing and sharing a lot with the team. So when I knew that I am coming back to Marinos, I know that it’s my time to share my experiences with the younger players, with the team. JPF: You are born and raised in Yokohama, you kicked start your amazing career as young as a youth player with the club back in the mid-80s. Tell us more about this special relationship between Yokohama F.Marinos and you? SN: There are many current Youth coaches here in Marinos who are actually from my younger playing days. Everybody is here at Marinos, we play together and we grow up together. We are just like a big family and cohesiveness within the club is amazingly good. JPF: How your teenager life is like? Just youth football training and school every day? SN: During my Junior High School and High School days, I was very active with my school team. I was also a regular player with Marinos Junior Youth. However, during my third year with the Marinos Junior Youth, I was dropped from the team probably because I was too skinny? So when I got into the High School, I started my own training in the school where there was no morning training for the school team. And right after the school ended, I continue to train alone (if there was no school team training) till the sky turned completely dark so that I could be reselected again and return to the Marinos team. JPF: (Question to Nakamura’s Manager, Mr. Akira Kodate, coincidentally also Nakamura’s High School mate) How was Nakamura as a student back in the High School? AK: Shunsuke was not a bad student, his favorite subject was Mathematics. He was also an extremely hardworking fellow especially when it came to football. (Nakamura interrupted…) Write down (in the article), I am not just good at football, I am intelligent too! JPF: Was it (ever) challenging for you constantly have to fight for a First XI spot in the National Team specially you are born in an era where they are many good midfielders such as Nakata, Ono, Ogasawara & etc? SN: It was not so much about a challenging one but a pressurizing for me. Like you have mentioned, we had many good Midfielders then like Hidetoshi Nakata, Shinji Ono and also head coach was Zico, there were so many things which I could learn from them. Among us, there is always a mutual respect for each others as we all know each of us have our own unique traits which we could contribute to the team. Shinji Ono, in particular, is the best player I ever played with. So all these years, I have always got a great and enjoyable time playing with these players at the highest level. So it’s definitely more pressuring for me to raise my game up to match them in the team. JPF: Which is your best moment with the National Team and who is your best mate in the National Team? SN: My playing time with the National Team is a mixture of up and down like a roller-coaster ride. For example, World Cup 2002, I was not picked. World Cup 2006, we didn’t do well and some of us (players) were even pinpointed to be the main culprits for the disappointing World Cup campaign. And lastly, for World Cup 2010, I was given the Number-10 shirt but I injured myself just before the World Cup. Eventually, I only managed to clock a couple of minutes in South Africa. Although it was quite a difficult times for me with the National Team, I remained positive just like how I used to work hard in the Junior High School to get myself back to the team. As far as “best moment” is concerned, it should be the Confederation Cup in France, year 2003. That year, I was playing for Reggina but the club was always toying around at the relegation zone hence I was feeling a little worried that I was stepping away from world-class football. That situation was not very ideal for me as a footballer as I still hope to be involved at the highest level of football during that time. So when the called-up for the National Team came for the Confederation Cup, I was delighted and I had great games against some top opponents such as France. I felt relieved with the called-up and that probably explained why I really enjoyed myself and had an enjoyable time at that Confederation Cup. Best mate wise, honestly I do not have any specific best mate. Although I have already retired from the National Team, I am still in contact with Shinji Kagawa, Shinji Okazaki & Hiroshi Kiyotake. We do meet up for meals too. 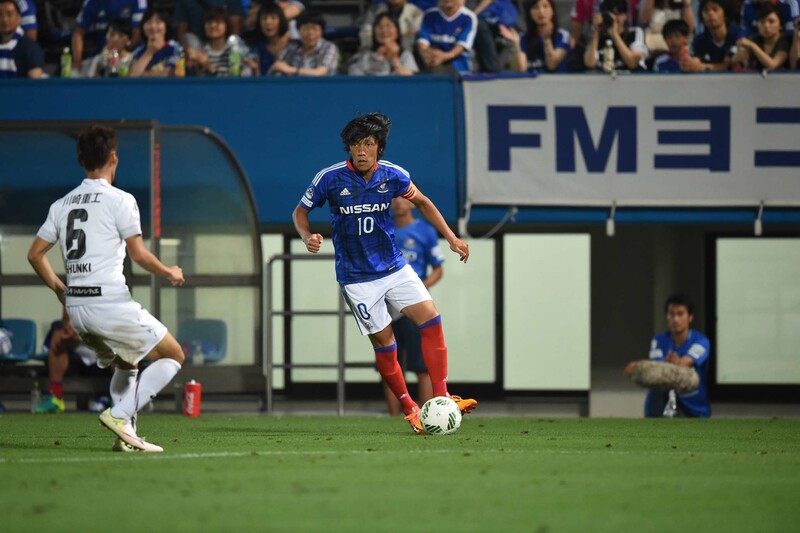 JPF: You are definitely a football icon/ambassador for Yokohama F.Marinos and Japan. 20 years of competitive football and still going strong, which has to be your most memorable moment thus far? SN: It has been a long 20 years so it’s hard to pick just one moment. But the most notable moment has to be my very first year with Marinos senior first team back in 1997. Then we had an ‘A’ Team and ‘B’ Team. As I was very skinny, I thought I would be in the ‘B’ Team but the Spanish coach thought the other way. So in my very first year of professional football, I was picked for the senior first team. Not long after, another Argentinian coach replaced the Spanish coach. And this Argentinian coach used to coach Maradona hence he loved to coach the team using Maradona as an example. Next coach who came in was a Brazilian and he used to coach Romario. Then, we had a lot of examples of Romario’s during training too. As a young player breaking into the senior first team for the first time, it was an enriching season with different stories of famous players for me. JPF: Can you still recall the match you played against Singapore? SN: Ah I remember that. We had a great team and we brought a strong squad, including many good Midfielders to Singapore. Our head coach was Zico and we were ready to play some good football. But I remember Singapore did not seems to be affected by our strong squad at all! It was tough game for us although we managed to secure a victory. 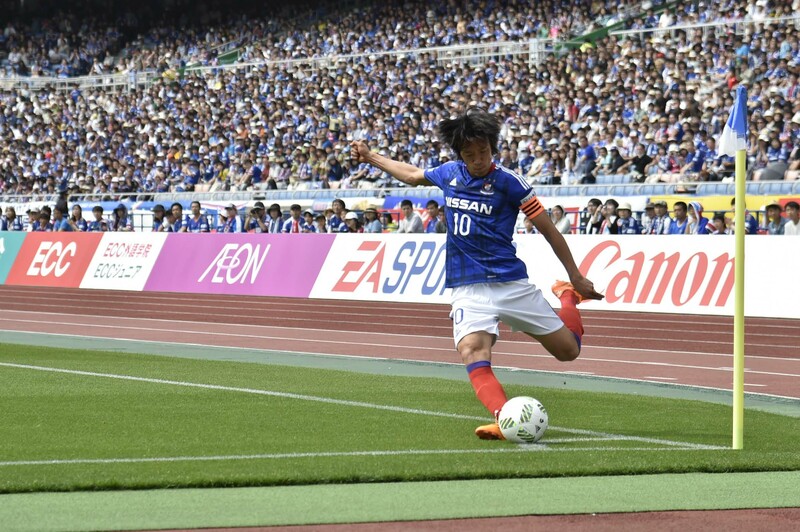 JPF: Japanese football legend, Kazu is still playing competitively at the current age of 49yrs old. Have you ever thought of how long would you want to continue to play? SN: I have always look up to Zinedine Zidane. When he retired at the age of 33 yrs old, I (then the age of 29 yrs old) have planned to retire at the age of 33 yrs old too. In fact, the very last time when I spoke about this, I did share that I would love to continue to play till I am 40 but it really depends on the condition of my body. I am taking it one season at a time. As long as I feel good, feel that it’s worthwhile to continue to play, I will continue to play. Gallery: More photos of Shunsuke Nakamura’s Interview, Click Here. Special Thanks to Yokohama F.Marinos, Japan Football Association, SingaCup – Singapore’s International Premier Youth Football Tournament, Puma Singapore & CabinZero. I enjoy checking your websites. Thank you so much!